Fracking opened up a whole new world of U.S. oil and gas production, along with a pandora’s box of impacts on the environment and climate. A reasonable person who wants to learn about those impacts might head over to the Environmental Protection Agency’s (EPA) extensive series of web pages covering the topic. But doing so today will land you on pages vastly different than you would have seen earlier this year. A new report released on Friday by the Environmental and Data Governance Initiative shows that the EPA overhauled many of its pages on fracking, shorthand for hydraulic fracturing. That term has all but disappeared from the site, replaced by “unconventional oil and gas”. A lot of context has also been wiped out, and while it’s not a wholesale deletion a la EPA’s climate change page, it illustrates how the government is limiting access to information and putting out propaganda for the industries it’s supposed to regulate. There are two ways to interpret the EPA’s replacement of the phrase “hydraulic fracturing” with “unconventional oil and gas.” The benign take is that the pages are now inclusive of a variety of ways we continue to extract fossil fuels from the ground. Fracking is just one step in one process to get at hard-to-access oil and gas. Unconventional oil and gas include all sorts of things like tar sands, for example, though the new EPA pages don’t get into those or even defining what the term means. The new homepage of the EPA’s unconventional oil and gas nee hydraulic fracturing page. There’s another, less charitable read on the change, though. Anti-fracking sentiment has been on the rise for years, and majorities of Americans of all political stripes favor tighter regulation, according to Gallup polling done earlier this year. The Trump administration does not agree. Unconventional oil and gas may well be more accurate in industry parlance, but it’s also far less used in public discourse. By removing nearly all instances of the term “hydraulic fracturing,” the EPA has created a bit of a bait and switch. The EPA removed a sentence about the prudence of understanding the risks of fracking. 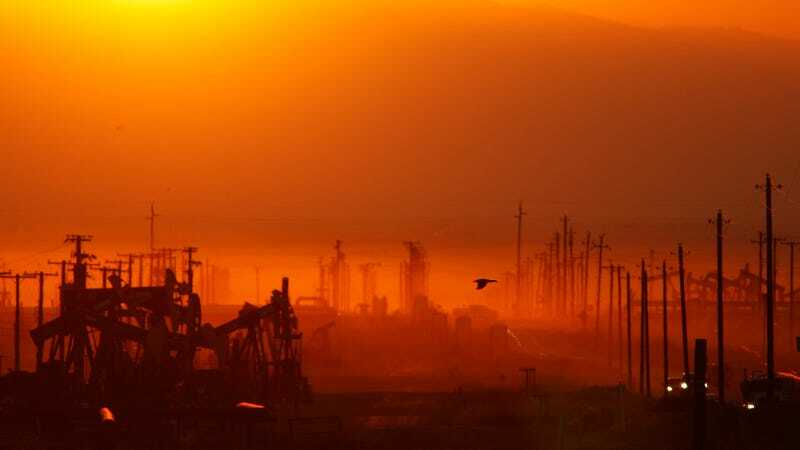 But the biggest omissions include no mention of seismic activity associated with fracking or of climate change, the biggest global issue when it comes to fracking. To be fair, the Obama-era page wasn’t any better in that regard. Both administrations’ pages talk up natural gas as something that “plays a key role in our nation’s c​lean energy​ future.” It’s true the fracking revolution that turned the U.S. into the world’s largest natural gas producer has also helped lower emissions by putting more polluting coal plants out of business. But natural gas and the processes to extract it still emit planet-warming carbon dioxide and methane. And we have a very finite number of years to stop doing that. The Trump EPA has by and large done the bidding of the industries it’s supposed to regulate. We’ve seen the agency attempt to rollback regulations on cars, power plants, and fossil fuel extraction while also limiting impartial outside advisors and hiring lobbyists and lawyers, including Andrew Wheeler, the current acting head of the EPA who used to lobby for the coal industry. The web pages it has altered or deleted, inclduing the hydraulic fra...errr, unconventional oil and gas pages, further demonstrate a devotion to taking industry’s side over the public. “[The EPA] is not doing environmental protection, it’s doing industrial promotion,” Ingraffea said.